Is Oracle Corporation (NASDAQ:ORCL) A Good Stock To Buy? Hedge funds and large money managers usually invest with a focus on the long-term horizon and, therefore, short-lived dips on the charts, usually don’t make them change their opinion towards a company. This time it may be different. During the first 6 weeks of the fourth quarter we observed increased volatility and small-cap stocks underperformed the market. Hedge fund investor letters indicated that they are cutting their overall exposure, closing out some position and doubling down on others. Let’s take a look at the hedge fund sentiment towards Oracle Corporation (NASDAQ:ORCL) to find out whether it was one of their high conviction long-term ideas. Is Oracle Corporation (NASDAQ:ORCL) the right investment to pursue these days? Prominent investors are taking a pessimistic view. The number of bullish hedge fund bets fell by 1 recently. Let’s take a gander at the fresh hedge fund action regarding Oracle Corporation (NASDAQ:ORCL). How are hedge funds trading Oracle Corporation (NASDAQ:ORCL)? Heading into the fourth quarter of 2018, a total of 49 of the hedge funds tracked by Insider Monkey were long this stock, a change of -2% from one quarter earlier. It’s not surprising that Oracle was not one of the 30 most popular stocks among hedge funds. 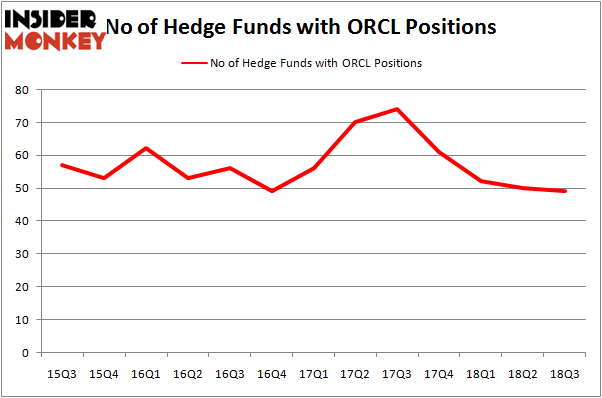 Below, you can check out the change in hedge fund sentiment towards ORCL over the last 13 quarters. With the smart money’s capital changing hands, there exists an “upper tier” of notable hedge fund managers who were upping their holdings significantly (or already accumulated large positions). 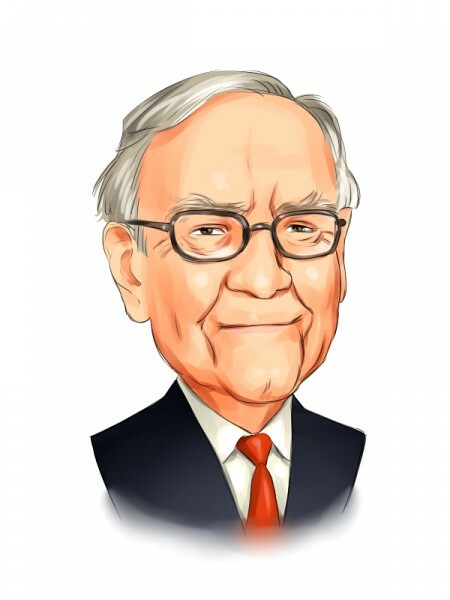 More specifically, Berkshire Hathaway was the largest shareholder of Oracle Corporation (NASDAQ:ORCL), with a stake worth $2134.8 million reported as of the end of September. Trailing Berkshire Hathaway was Eagle Capital Management, which amassed a stake valued at $1237.9 million. Fisher Asset Management, Yacktman Asset Management, and Pzena Investment Management were also very fond of the stock, giving the stock large weights in their portfolios. Because Oracle Corporation (NASDAQ:ORCL) has experienced declining sentiment from hedge fund managers, it’s easy to see that there were a few money managers who were dropping their entire stakes last quarter. It’s worth mentioning that Anthony Bozza’s Lakewood Capital Management said goodbye to the largest position of all the hedgies followed by Insider Monkey, valued at about $9.3 million in stock. Bart Baum’s fund, Ionic Capital Management, also dropped its stock, about $6.8 million worth. These moves are intriguing to say the least, as total hedge fund interest fell by 1 funds last quarter. Let’s check out hedge fund activity in other stocks similar to Oracle Corporation (NASDAQ:ORCL). These stocks are Merck & Co., Inc. (NYSE:MRK), Toyota Motor Corporation (NYSE:TM), Citigroup Inc. (NYSE:C), and Fomento Económico Mexicano, S.A.B. de C.V. (NYSE:FMX). This group of stocks’ market values match ORCL’s market value. As you can see these stocks had an average of 44.75 hedge funds with bullish positions and the average amount invested in these stocks was $4206 million. That figure was $8089 million in ORCL’s case. Citigroup Inc. (NYSE:C) is the most popular stock in this table. On the other hand Toyota Motor Corporation (NYSE:TM) is the least popular one with only 9 bullish hedge fund positions. Oracle Corporation (NASDAQ:ORCL) is not the most popular stock in this group but hedge fund interest is still above average. This is a slightly positive signal but we’d rather spend our time researching stocks that hedge funds are piling on. In this regard C might be a better candidate to consider a long position. Is Pure Storage, Inc. (NYSE:PSTG) A Good Stock To Buy? Hedge Fund Sentiment Is Stagnant On Boston Beer Co Inc (NYSE:SAM) Hedge Funds Aren’t Crazy About Meritage Homes Corp (NYSE:MTH) Anymore Is Mattel, Inc. (NASDAQ:MAT) A Good Stock To Buy? Here is What Hedge Funds Think About Las Vegas Sands Corp. (NYSE:LVS) Do Hedge Funds Love Catchmark Timber Trust Inc (NYSE:CTT)?